It is exactly this interpolation that your browser does for you. While life is pretty good when your browser helps you out so much, this help does come at a cost. You need to be pretty precise about your keyframes the various points in time you want your properties to have a certain value. This precision makes animating many realistic scenarios very difficult. Some scenarios include moving an element around on a curve, simulating an object free-falling under the influence of gravity, adjusting properties by a random value, dynamically changing the interpolation, using custom timing functions, oscillating a value in random amounts each cycle, and many MANY more. What you will see is a blue circle sitting very still. Click or tap on the move button and notice what happens. The blue circle slides a little bit to the right. Keep pressing the move button to continue sliding the circle right. The faster you press the move button, the faster the circle will move. After a bunch of presses, the circle will eventually disappear on the right, but don't worry. If you keep pressing the move button, the circle will reappear on the left hand side and continue its journey rightward. This leads to the circle's position jumping to the left and appearing from the left side as we keep clicking the move button. Pretty straightforward, right? Now, what we have currently is not an animation. We keep clicking on the move button, and each click causes our animate function to move our circle a a few pixels to the right. What we want is for our circle to move automatically, and that can be done by calling our animate function repeatedly in a regular interval. This is where the animation loop will help. Here is the deal. The animation loop is nothing more than a function that gets called repeatedly thanks to a boring old timer function. The boring timer function we are going to use for performing this important task is requestAnimationFrame. Let's modify our example to use it! 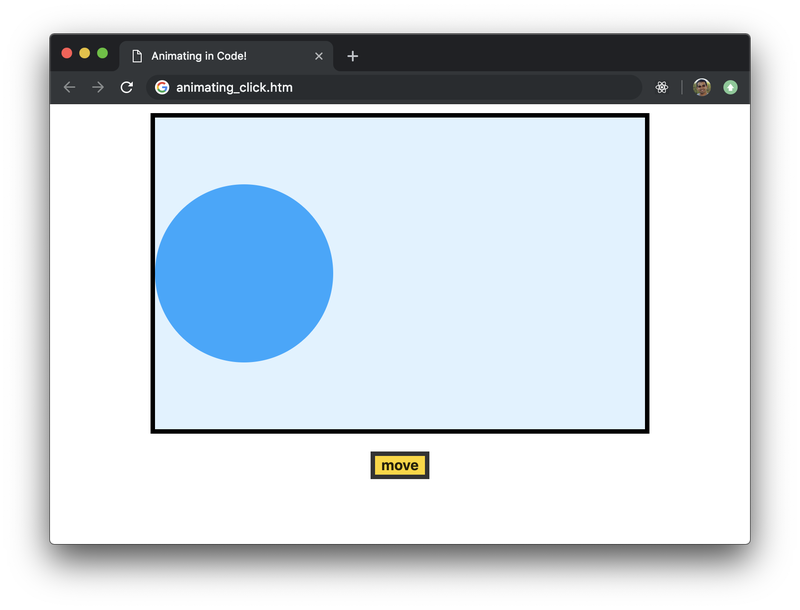 Notice that we really didn't change a whole lot, but by adding the requestAnimationFrame call we turned our boringanimate function into an exciting animation loop that is now responsible for moving our circle to the right by 10 pixels at every frame update.